Wash strawberries and cut them in pieces. Peel cucumber, cut it in half and remove seeds. Cut bell pepper into strips and remove seeds. Blend fruit and vegetables with one tablespoon of olive oil and two tablespoons of balsamic vinegar until you get a smooth and homogeneous puree. Season with salt and pepper, cover with plastic and keep in the fridge until ready to serve. Cut the bread into 1/4" cubes, dress them with a little bit of olive oil and toast in hot oven for about 10 minutes or until crisp. Cut some strawberries into small cubes and season them with chopped basil, salt, and a few drops of agave. Peel half of a cucumber, remove seeds and cut into cubes. 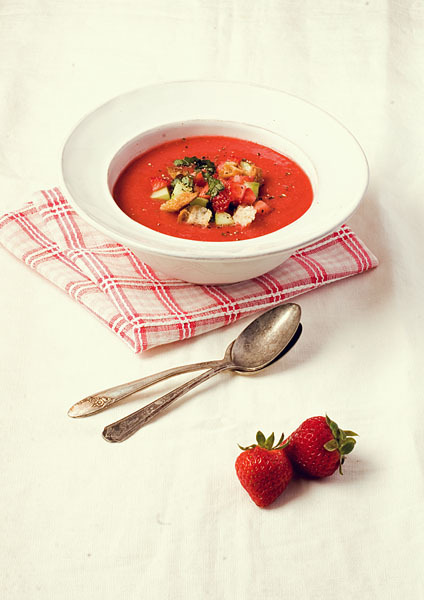 When ready to serve the gazpacho, decorate each bowl with a handful of toasted croutons, diced strawberries and cucumbers, and sprinkle with black pepper. Exposure to particle pollution can burning eyes, runny nose and other serious health problems, including aggravated lung disease, asthma attacks, acute bronchitis and an increase risk of respiratory infections. Limit outdoor activities and keep children indoors if it is smoky. Please follow medical advice if you have a heart or lung condition. Google Earth is a multi Ray Ban Sunglasses Sale UK platform software application for viewing imagery of the earth surface. It allows users to view the planet via satellite imagery, detailed maps, 3 D images and other tools enhanced with Google Street View, search, audio and video services. It is even possible to view neighborhoods with the capability Longchamp Soldes Destockage to zoom in on private residences.